A man convicted of killing the brother of Baltimore County spokesperson T. J. Smith was sentenced to 80 years in prison on Monday. BALTIMORE — A man convicted of killing the brother of Baltimore County spokesperson T. J. Smith was sentenced to 80 years in prison on Monday. 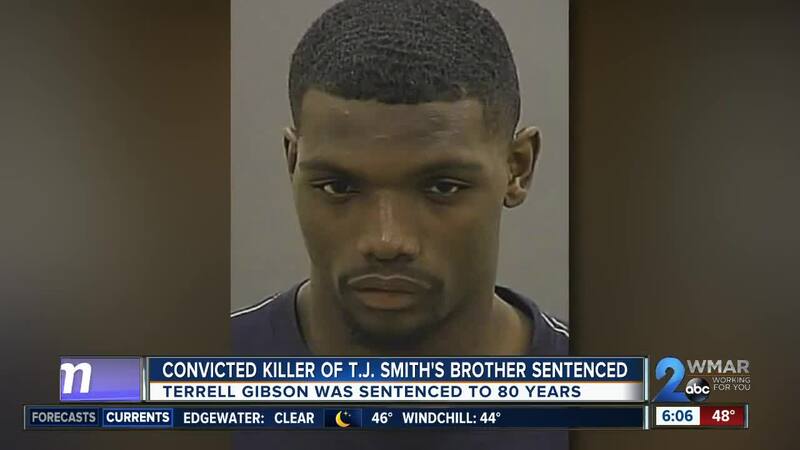 Terrell Gibson was found guilty last September of killing Dion Smith, the late brother of T. J. Smith, the former Baltimore City Police spokesman and current Baltimore County spokesperson. For Smith's death, Gibson will now serve life in prison, suspended all but 65 years, and then an additional 15 years for a gun charge. During the sentencing hearing on Monday in one of the smaller courtrooms in Mitchell Courthouse, there was no more than six feet between the man who often announced this city's murders and the man who was convicted of murdering his own. "My family was looking forward to an apology actually and surprisingly, we got an excuse," said T. J. Smith. Gibson maintained he didn't do it when he addressed the court, despite surveillance video that showed him lying in wait, despite forensic evidence that showed the shotgun blast was at point black range, and despite Gibson's conviction of killing his friend Dion. "Just a simple apology," Dion's father Marlin Smith said. "You're convicted. We just wanted a simple apology for our family and mostly for his children because they will grow up without him. He didn't grow up without a father, but his children will." T. J. Smith gave a victim impact statement saying that while he is sympathetic to Gibson’s rough upbringing, he still chose to put a shotgun up to his brother’s face and pull the trigger. At one point he argued directly to the judge that the courts can, and should, be sending a strong message. "I wanted to say on behalf of my family, and myself as a former person who spoke about this often to the court, that you have a responsibility in this as well. The people who I spoke about often who were victims of violent repeat offenders are victims because of the sentences that have been imposed," Smith said. It was an intimate killing and T. J. Smith argued for the max sentence. He later sent out a tweet with the following statement saying that his family is fortunate for how things turned out. "I’m relieved and appreciative of everyone who’s been along for this journey. My life changed on July 2, 2017 the day my little brother, Dion, was viciously taken away. My family is fortunate, that through video evidence and brave witnesses, the @BaltimoreSAO was able to secure a guilty verdict from 12 citizens of Baltimore. As we move on from this phase, I can only pray that Dion’s young children won’t harbor anger and animosity over what occurred when they were toddlers. It’s much more than “the victim” who are the actual “victims” of violence. As I told the judge today, the suspect had all day, as he preyed on my brother, to make a different decision. I truly hope and pray that at least one person reading this thinks about the consequences of their actions before carrying out a decision you can’t reverse. Sure, Gibson had a tough life. Many people do. But that doesn’t give you a right to harm other people. I will stand by the fact that “hurt people, hurt people”, but that is not an excuse for doing it. But us knowing that need to focus on mental health and trauma informed care to ensure we are recognizing these problems before they physically hurt people. Dion is at peace and his family is working through the stages of grief. And I absolutely understand that we received something that not everyone gets- accountability and closure. Thanks again for everyone’s thoughts and prayers as this played out publicly. But let us not forget the many others who are also looking for closure. And let’s work to limit the amount of young men who have to face a judge to determine their future. Young men, listen." And while T. J. Smith said that Gibson never showed remorse, his mother testified he had a heart of gold, but because she was in prison, he had a hard life. “No one showed him love,” Gibson's mother said in her statement to the court. The judge said Dion’s murder was in the “most brutal fashion,” before handing down his sentence. Gibson indicated he would be appealing the judgment.